Terry (Alexander Skarsgård) and Bob (Michael Peña) are two crooked cops who frame and blackmail criminals all over town. Looking for the ultimate pay-off, they try to extort a strip-club manager (Caleb Landry Jones) and his eccentric, junkie boss (Theo James), but get more than they bargained for when their hair-brained scheme uncovers a bigger, darker secret. 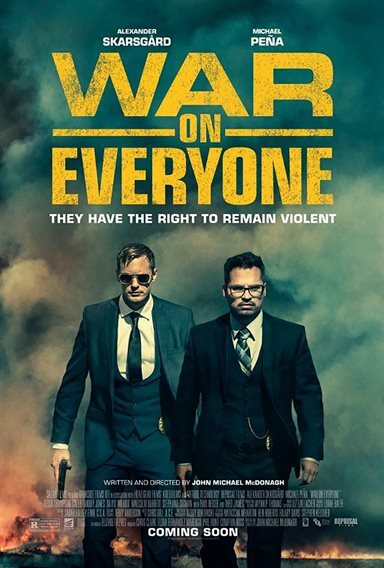 Download War on Everyone in Digital HD from the iTunes store. 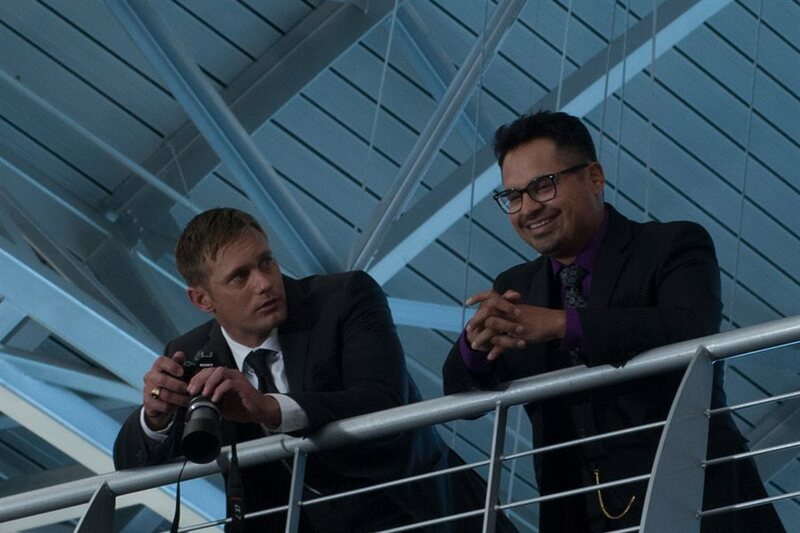 War on Everyone images are © Lionsgate. All Rights Reserved. 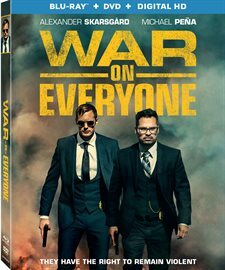 War on Everyone can best be summed up by the title of the featured extra… "Everyone sounds off: The Quirky Cast of War on Everyone". Quirky, defined as different from the ordinary in a way that causes curiosity or suspicion, is synonymous with bizarre, crazy, curious, etc. All of which are apt descriptions of this movie. Coming out in a Blu-ray combo pack that includes a DVD and Digital Download, this movie is a whole lot of quirky and more. Bob (Michael Pena; Chips) and Terry(Alexander Skarsgard; True Blood) are two crooked cops. They shake down bad guys for money and drugs and frankly don't exactly care about what's right – at least as far as where criminals are concerned. It's actually amazing that they manage to stay on the force as long as they have with so few complaints against them but then again, I'm not sure too many criminals are willing to go on the record. They are partners and friends who have a good racket going until they push their luck too far. The duo stumbles upon a plotted heist that will net a million dollars but by the time they catch up, the gig is over and the money is gone. They manage to find their informant who tells them he only got a twenty percent cut of the take and had to give the rest to the guy who planned the job – a businessman named James Mangan (Theo James; Divergent). As they pursue Mangan and his associates, they find they may be in over their heads, as Mangan and his group exact revenge on the cops and eventually get them fired. In an ultimate showdown reminiscent of a good western shootout, Terry and Bob get their own revenge and kill some bad guys in the process. Skarsgard and Pena have great timing and an easy rapport that make the plot just a little more interesting. They have funny moments and a genuine friendship that comes across on screen. It's easy to believe they are best friends and are, literally, partners in crime. James plays slightly against his usual pretty boy, heartthrob type as he takes on the role of a gangster like head honcho type who is ruthless as well as a drug addict. It was a nice change for him but, unfortunately, I don't think he quite pulls it off. Honorable mention needs to be given to Caleb Landry Jones who plays an offbeat guy who doesn't seem quite "all there". His uniqueness is as memorable as the weird brother he played in Get Out. The plot is recycled and doesn't offer much in the way of originality and the writing makes the whole thing a little messy and confusing. While definitely "quirky" it is also stupid with moments of humor. These glimpses of comedy, along with the cast, are what make the film somewhat redeemable. Unfortunately, Director/writer John Michael McDonagh (Calvary) doesn't offer enough laughs to move the plot along at a decent pace. The Blu-ray is presented in 1080p high definition video with an aspect ratio of 2.39:1, which allows for some rather sharp picture quality, as well as deep and true color hues across the full spectrum. The DTS-HD Master 5.1 audio accentuates an eclectic soundtrack and offers the audience a nice mix of clear dialogue with some gun shots thrown in. As mentioned before, the only feature on the disc is a mere few minutes long, as the actors describe their characters and the basics of the plot. Besides quirky, the film is stupidly funny at times, which helps to redeem the not fully formed storyline. The cast works with what they had but I suspect they could have done more with stronger writing and fewer curse words. While not a cult classic in the making, the movie is probably best enjoyed sitting around with alcohol (for those over 21), snacks, and a few good friends. 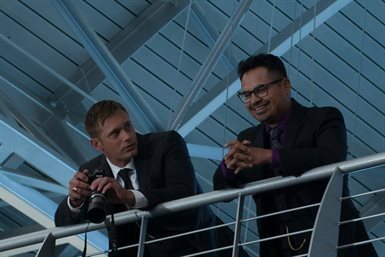 War on Everyone images © Lionsgate. All Rights Reserved.